Just in time for the holidays... if you have a LEGO fan in your family like we do, then this is the perfect freebie for you! 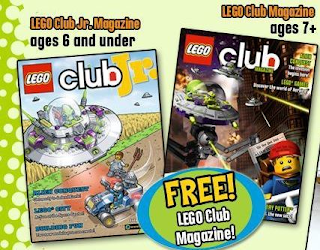 Right now, you can get a FREE two year subscription to Club LEGO Magazine! My daughter receives this magazine and she absolutely loves it! She gets super excited every time her new magazine arrives in the mail, and can't wait to start reading it! LEGO Club membership is valid for two years and includes free copies of LEGO Club Magazine or LEGO Club Jr. depending on the member’s age. Please allow 6 to 14 weeks for delivery of your first mailing. Offer is limited to one free membership per person, group or organization. Membership can be extended for free and cancelled at any time. By submitting this form you consent the LEGO Club to use your (or your child’s) data for LEGO mailings. Be sure to get your little LEGO fan their free magazine subscription, TODAY! These magazines are a HUGE hit in our home. Every time our son gets one in the mail, he gets so excited. It's nice because on top of being fun, it encourages him to read. My son also receives this magazine. 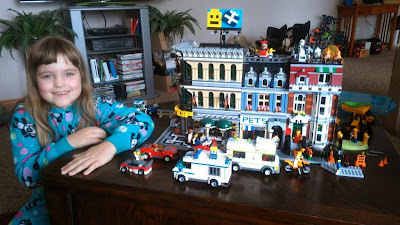 He is a huge fan of Legos, so he really enjoys it. It's seriously an amazing freebie! My grandson loves Mega Bloks so I bet in a few years he would love a magazine subscription like this! All three of my kids love getting this magazine in the mail too. I actually have to set a timer the first week so everybody gets a chance to look at it and to reduce arguments over whose turn it is.